Description: Sue, the cute little wooden turtle, has had a very hard day! When pulled, this sound sleeper "walks" in her sleep as she wags her tail and snors loudly with a "snoozy-snooze" sound. FPT4254 - Small wooden cut-out turtle with paper lithographs on the sides and edges of a yellow turtle with closed sleeping eyes wearing a blue and white checkered dress with a white collar. 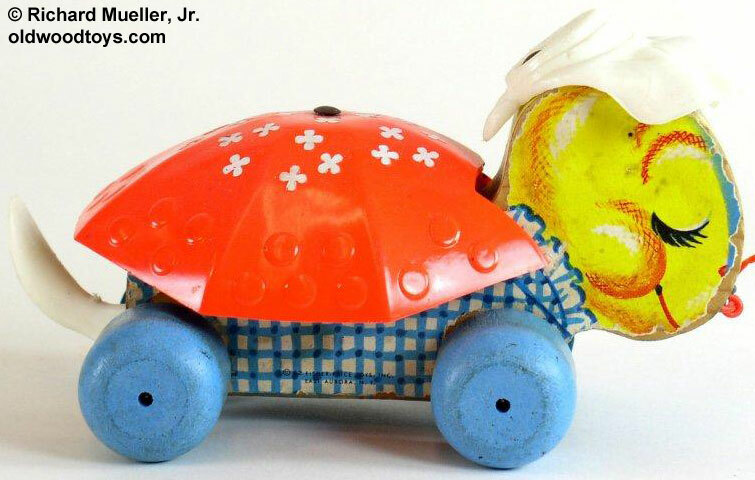 The turtle wears a white plastic bonnet, has a white plastic tail, and a red plastic shell with white + shaped designs on the top. She rolls on 4 wide blue wooden wheels. When pulled, she wags her tail and makes a "snoozy-snooze" sound. Measures 6-1/4" long, 3-1/2" high, and 4" wide. Also see 1957-1962's #496 Tiny Tim.